Exposure compensation is a valuable tool for any photographer. 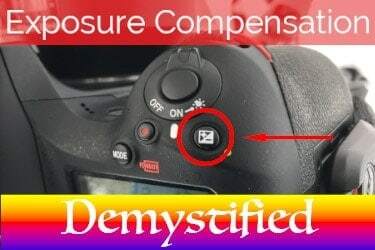 If you’ve been confused about what exposure compensation is or how to properly use it, then this article will demystify exposure compensation for you. In all honesty, I was confused by how to properly use exposure compensation for a long time and then finally had that ah-ha moment. That’s what I want to share with you in this article. I’ll explain why you would want to use exposure compensation and how to use it to properly manipulate those difficult to expose images. This may be a review for some of you, but please bear with me as we all get on the same page. Exposure is basically the amount of light that hits your camera’s sensor. Exposure is controlled by three separate but interrelated settings known as the exposure triangle: shutter speed, aperture, and ISO. Each of these settings can be individually adjusted to change the exposure of an image. When you shoot in full manual mode, then you have to determine how to adjust each of these settings in order to achieve the exposure you would like to get. Of note, there is no such thing as “correct” exposure; the proper exposure is what the photographer envisions for an image, which is up to his or her artistic expression. That said, in order to know how to get the exposure you envision for a given image, then you need to understand how to control exposure. This is why learning how to shoot in manual mode opens up endless opportunities for improving one’s photography. You really get a sense for how shutter speed, aperture, and ISO control exposure and how to manipulate these to get the image and emotion you desire. Be sure to check out this Improve Photography article for more details on the exposure triangle. So we’ve established that exposure is controlled by shutter speed, aperture, and ISO. The unit of measure of exposure (i.e., light hitting the sensor) is in “stops”. A full stop is measured as a doubling or halving of exposure depending on whether the change is increasing or decreasing exposure, respectively. Each of these options would give you one stop of increased exposure or a doubling of light. Which setting you choose depends on the effect you would like to achieve in your image. A luminosity histogram is basically a distribution curve of all of the tones of the pixels in an image. The x-axis ranges left to right from black –> shadows –> mid-tones –> highlights –> white. The y-axis shows how many pixels in a given image are present in each tonal range. See the figure below for examples. The image on the left of my black lab shows a tall peak in the shadows, which makes sense since the majority of the image is dark. The image in the middle of the frozen waterfall has a more even distribution of lights and darks and mid-tones, as illustrated by the histogram. The image on the right contains mostly snow, and so that histogram shows a tall peak in the highlights area. Ideally, you want your histogram curve to be between the shadows and the highlights without touching the very ends (blacks or whites), which would result in the loss of pixel information (called clipping). The histogram is the best way to make sure you are properly exposing your scene. The LCD display can fool you, and so you shouldn’t trust the appearance of an image on an LCD screen alone to determine whether you’ve nailed the shot. More on histograms and how they relate to exposure compensation later. I prefer to shoot in manual mode and encourage anyone learning photography to master manual mode to fully understand exposure and to open up the most opportunities for creativity. That said manual mode isn’t necessarily the best mode to use in every situation. The other modes available include shutter priority (indicated by S or Tv), aperture priority (indicated by A or Av), and fully automated or program mode (P). 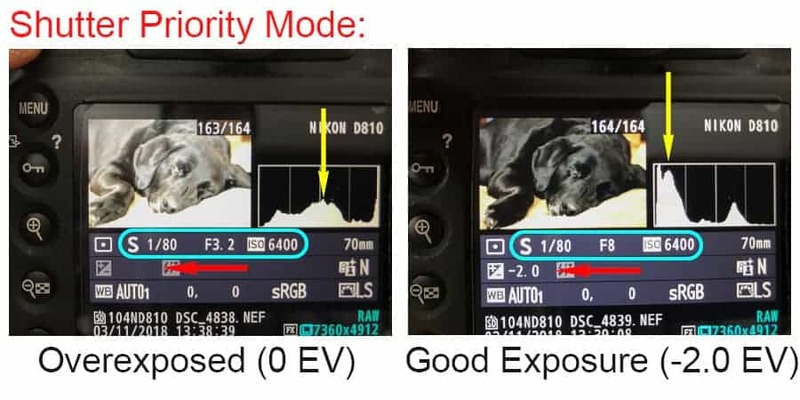 Relevant to this article, exposure compensation only works with shutter priority mode, aperture priority mode, program mode, and manual mode with auto-ISO. It will not work with fully manual mode. Shutter priority and aperture priority are semi-manual (or semi-automated) modes. In shutter priority mode, you set the shutter speed and the ISO, and the camera automatically finds the best aperture to use to properly expose the image, meaning the camera will try to keep the histogram curve in the middle. Shutter priority mode is helpful when you are photographing subjects that are moving and you want to quickly freeze motion (fast shutter speed) or get a motion blur effect (slow shutter speed). In aperture priority mode, you set the f/stop and the ISO and the camera chooses the shutter speed to get a proper exposure. Aperture priority mode is helpful when you want to control the depth of field of an image. In either priority mode, you may have to also adjust the ISO under certain conditions to get the histogram right, or use auto-ISO so that the camera adjusts the ISO accordingly. So, we’ve established what exposure is and how to change it with shutter speed, aperture, and ISO and how to measure exposure with our histogram. There is one more thing we need to discuss before getting into exposure compensation and that is how camera meters work. Camera meters are super handy in assisting us to achieve “correct” exposure. However, this “correct” exposure is determined by the camera, not by you, the photographer. There are limits to how well camera meters work to determine the right exposure for an image, and sometimes they can be thrown off. Camera meters measure reflected light rather than ambient light. Often, reflected light provides an appropriate approximation of what the exposure should be for a given subject. But not always. Depending on what you are photographing, the camera’s metering system may be way off, and that is where exposure compensation comes in. The only goal of the camera meter is to get the exposure settings to achieve an average of “middle grey”, which is what our eyes perceive as halfway between black and white. This has historically been defined as 18% of reflected visible light, or 18% grey, and camera meters are calibrated against this standard. This is the standard that would properly expose most images. But what if your scene doesn’t average out to that 18% grey mid-tone? Let’s think of a simple example. We are shooting in shutter priority (or aperture priority or program) mode. We have a white piece of paper, an grey piece of paper, and a black piece of paper. If we focus the camera on just one piece of paper at a time, the camera’s meter will read the scene and adjust the exposure settings such that 18% grey is achieved. Because the black paper reflects little to no light, the camera’s meter will overexpose the image attempting to get it closer to middle grey. On the other hand, the white paper will reflect a lot of light, so the camera’s meter will underexpose it to get to middle grey. The grey piece of paper would be exposed juuussst right. A scene without a lot of mid-tones in it may throw off your camera’s metering system, and that is where exposure compensation becomes very useful. Exposure compensation is the way to override your camera’s metering system while shooting in anything but full manual mode. When you shoot in full manual mode, there is no reason to use exposure compensation because you already have complete control over the three elements of exposure. 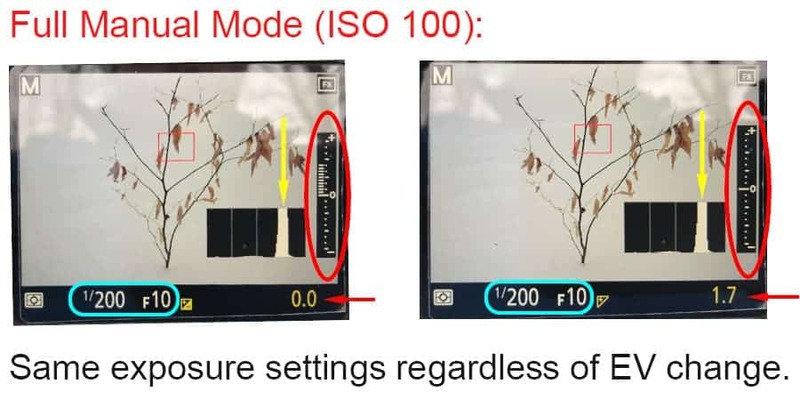 However, if you are photographing using one of the priority modes, program mode, or manual with auto-ISO, then the camera has partial control over one or more elements of exposure. Exposure compensation is used to overcome the camera’s determination of a “proper” exposure. As I said before, the camera isn’t always right in figuring out the best exposure of an image because it is basing that determination off of reflected light and is trying to get to middle grey. 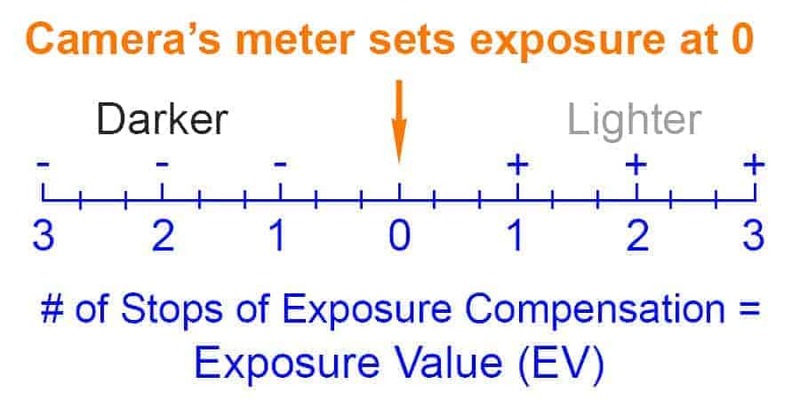 Exposure compensation is measured in 1/3 stops of exposure, which are expressed as exposure values (EV). You will often see exposure compensation represented by a + or – EV value. As you adjust the exposure compensation, you should observe the camera’s exposure meter scale move accordingly. The camera’s meter will indicate that the exposure is either overexposed or underexposed. The best way to see whether you’ve chosen the ideal level of exposure compensation is to check your histogram. The histogram doesn’t lie. How to Use Exposure Compensation? It is very easy to use exposure compensation. Most DSLR cameras have the ability to dial in up to 3 stops of exposure compensation in a positive or negative direction. Some higher end cameras may go as high as +/-5 stops. Most cameras come with a +/- button on the top or near the LCD screen. Holding this button down and moving the command dial is how exposure compensation is adjusted on most cameras. Some cameras have a separate EV wheel, and others may have it accessible in one of the menus. It’s best to check your manual if you can’t find it easily. Using exposure compensation in aperture priority mode. The red circle indicates the camera exposure meter scale. The yellow arrow points to the histogram. The red arrow points to the EV value. The teal circle indicates camera settings. In the first figure, I used aperture priority mode, f/11, and ISO 100. The camera’s meter determined that to get what it calculated to be proper exposure (0 on the meter scale), my shutter speed should be 1/125 second. You can see from the image on the left, that without any exposure compensation, the snowy scene looks underexposed and grey. We all know that snow is white, and the reflected light of the snow is what is messing with the camera’s meter. On the right, I used exposure compensation to override the camera’s meter, and watched the histogram as I pushed the highlights to the right on the histogram (without clipping them). This took +1.7 EV, and resulted in a new shutter speed of 1/40 second. This image looks properly exposed. Using exposure compensation in shutter priority mode. The red circle indicates the camera exposure meter scale. The yellow arrow points to the histogram. The red arrow points to the EV value. The teal circle indicates camera settings. In the next figure below, I did the same test using shutter priority mode, 1/200 second, ISO 100. The camera’s meter determined that an aperture of f/10 would give me the proper exposure (see image on the left and note the meter scale). Again, this image appears underexposed. As shown in the image on the right, I used +2.0EV to override the camera’s aperture choice to increase the exposure of the image. As a result of +2.0 EV, the aperture was opened up to f/4.5, which is 2 stops more exposure than what the camera originally set. Using exposure compensation in shutter priority mode. View from the back of the camera. The yellow arrow points to the histogram. The red arrow points to the EV value. The teal circle indicates camera settings. Exposure compensation can also be applied to dark scenes. Here is an example of my napping black lab (what a sweetie, right?). Using shutter priority mode, 1/80 second, ISO 6400, the camera set the aperture at f/3.2 to get the meter scale to read out at 0. If you look at the histogram, you can easily see that the image on the left is overexposed – even the highlights are clipped off the right edge. This is because the camera doesn’t realize that the scene is supposed to be mostly black, and it overcompensated. On the right, I used exposure compensation to reduce the exposure by -2.0 EV, while watching the histogram to make sure I didn’t clip any shadows or blacks. This override adjustment changed the aperture to f/8, which represents 2 stops of decreased exposure compared to the camera’s original determination. Exposure compensation only works in shutter priority, aperture priority, program, or manual with auto-ISO modes. Use exposure compensation to override the camera meter, which may incorrectly determine “proper” exposure for a given subject. Use the histogram to determine proper exposure, not the exposure meter scale. So I think I finally understand exposure compensation, and I hope this article helped clear up any confusion you may have had as well. I am still confused by one thing, though. 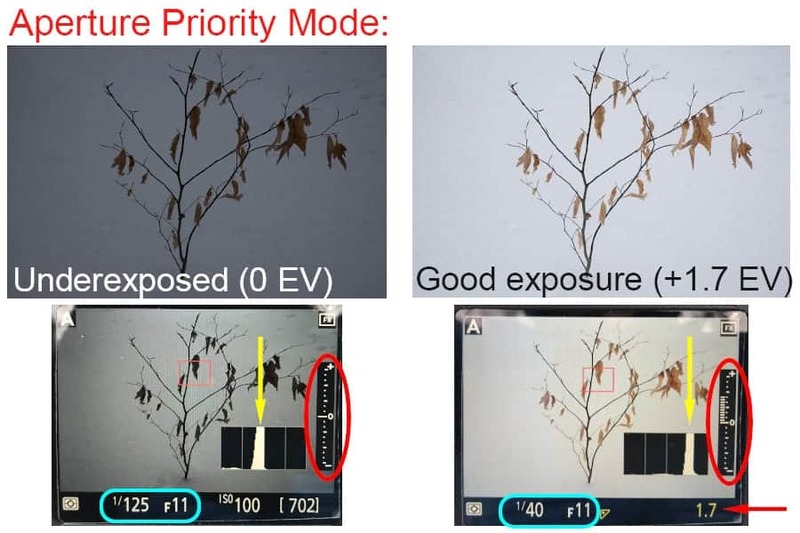 Exposure compensation does not affect exposure when using full manual mode. That makes sense to me. But, my camera’s exposure meter still responds if I attempt to use exposure compensation while in full manual mode. Using exposure compensation in full manual mode. The red circle indicates the camera exposure meter scale. The yellow arrow points to the histogram. The red arrow points to the EV value. The teal circle indicates camera settings. I think this is what had me confused for so long. 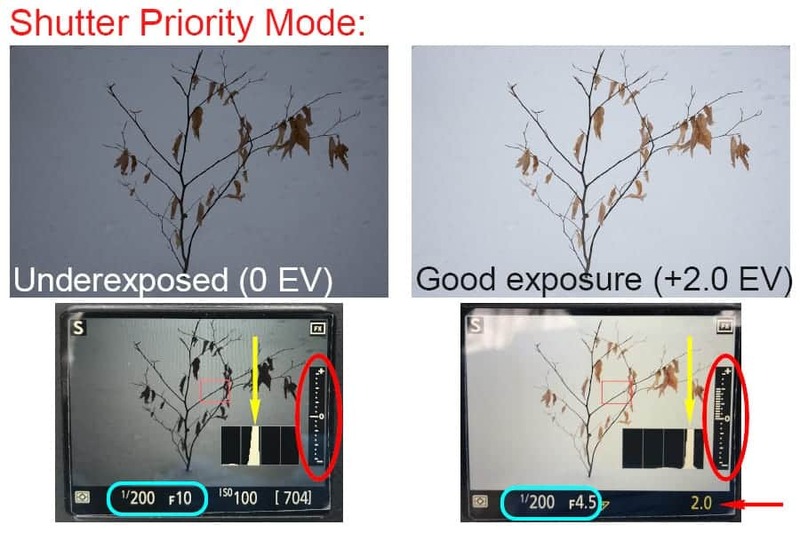 According to the exposure meter scale, it appears as though making exposure compensation adjustments in full manual mode is having an effect on exposure, but it isn’t. See the example below. Here I set the camera (Nikon D810) to full manual mode: 1/200 second, f/10, ISO 100. The left image shows the exposure meter with no exposure compensation, and the right image shows it with +1.7 EV. Note that the shutter speed, aperture, ISO, histogram, and image all remained the same, as would be expected in full manual mode. Exposure was unaffected, yet the exposure meter decreased by 1.7 stops. It’s a head scratcher. I can’t figure out what the value of this information on the scale would be. If any of you out there can explain this phenomenon, I’d love to hear your thoughts! Thanks!